This article describes different encoder options you can use with the Field59 live stream platform. Field59’s platform works with many different encoder options, including the hardware and software encoders listed in the matrix below, as well as others not listed, such as Matrox, Tricaster, and Open Broadcast Software. The video wrapper can be either .flv or .mp4 file formats. Once the video is encoded, it needs to be sent via RTMP, RTP, RTSP to our live streaming servers (RTMP is preferred). Then our live streaming servers take your one feed and create several streams of different types, sizes, and bit rates to ensure that your stream plays on any device. The streams are then made available via a content delivery network (CDN), which allows viewers to access your stream from cloud servers close to them for improved performance. Here’s a matrix comparing our encoder with 3 other popular methods of streaming. At Field59, we use all of these methods, so what’s best for you really just depends on your need! *There are many video capture devices available for computers running Adobe Flash Media Live Encover. Even built-in webcams can be used. The only limitation is the hardware being used for A/V capture. 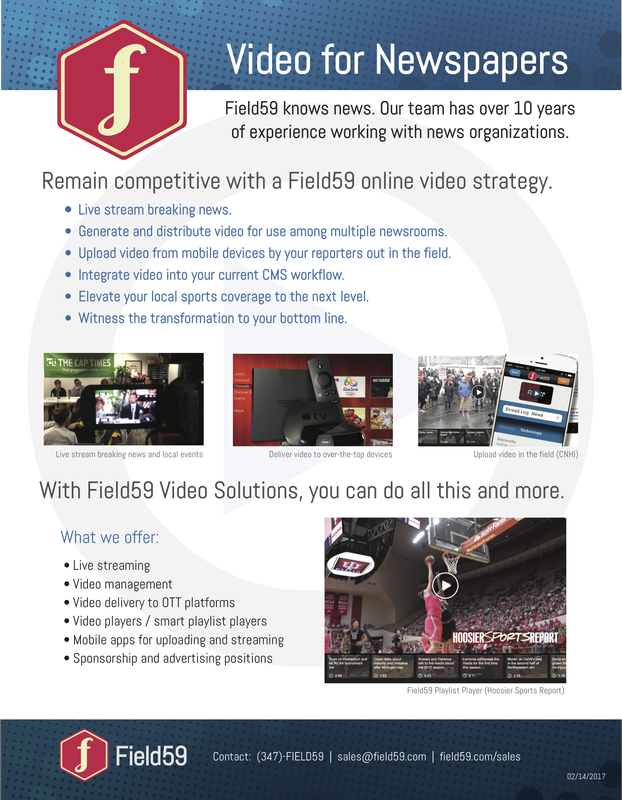 *** All necessary configuration/setup elements for live streaming will be provided by Field59. If Field59 is setting up an encoder, then networking and video format information is requested from the client and set up prior to shipping. Note: The above is a simplification of encoder setup and feature sets. Other unconventional configurations may be used but are not represented. For example, it is possible to use a Field59 encoder with WiFi if a WiFi router is set up in bridge mode and configured to connect to your WiFi.